The Rev. Dr. Donald K. Gillett II, Executive Director of the Kentucky Council of Churches, and Senior Pastor of East Second Street Christian Church, Lexington, KY, will preach at the Friday evening worship service. The Rev. 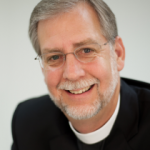 Dr. William O. Gafkjen, Bishop of the Indiana- Kentucky Synod, ELCA, will preach at the Sunday morning worship service. Please note that Bishop Gafkjen will provide a copy of his sermon in advance for congregational use. It will also be available in a digital format so that it could be shown on a Sunday morning or other time.